About The Book Unaccustomed Earth, available in paperback, is a collection of many short stories. These stories revolve around the lives of Indian American people in an environment with a mixed culture. The stories in this book are categorized into two parts. Part one contains Unaccustomed Earth, Hell-Heaven, A Choice of Accommodations, Only Goodness and Nobody's Business. The second part consists of Once in A Lifetime, Year's End and Going Ashore. The title story of the book revolves around characters belonging to three different generations and the relationship they share. The story discusses the obligations faced by families with an Indian heritage. The themes of all the stories in Unaccustomed Earth are not just cultural, but very universal and can be understood by anyone. It discusses how Indian families feel guilty about having adapted a new culture and enjoying it as well. While it shows the detachment of older generations from the original culture they grew up with, it also portrays a picture where the youngest generation is curious about old Indian habits, traditions and languages. 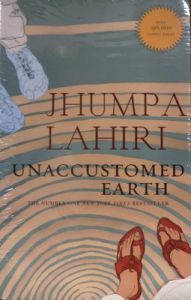 Unaccustomed Earth was published on 1 May 2009. Across other stories in this book, the author explores stories where emotions like love, loneliness and jealousy are explored. The fact that people change substantially over time is well-expressed. The second part describes the lives of acquaintances who meet after decades to discover a strong connection. Key Features This book was listed on top of the New York Times Book Review's 100 Best Books of 2008s. It was awarded the 2008 Frank O'Connor International Short Story Award. About the Author: Jhumpa Lahiri, born as Nilanjana Sudeshna Lahiri, is a famous Indian American author. She's a part of the President's Committee on the Arts and Humanities. Apart from this book, she has also authored a short story collection called Interpreter of Maladies and novels like Namesake and The Lowland. She has been awarded with the Pulitzer Prize in the fiction category and was nominated for the National Book Award for fiction and the Man Booker Prize.